The connection of the two ankle bones (tibia and fibula) are formed by four ligaments called the syndesmosis. 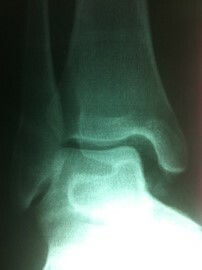 This is the ligament that is frequently injured in high ankle sprains. 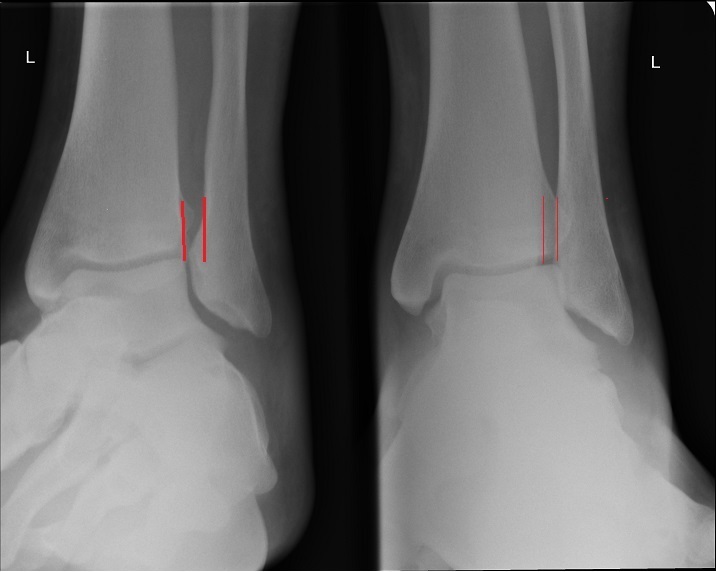 Injuries of the syndesmosis are commonly associated with ankle fractures. One or more of these four ligaments can be partially or completely ruptured (torn). Without fractures, sprains can occur when the foot is in an up position relative to the ankle and the leg (tibia) externally rotates. Continued rotation can cause complete tear of the ligaments and force the outer leg bone called the fibula to move to the outside. High ankle fractures may often follow. Being hit or kicked in the outside of the lower leg in a sport such as soccer or football may cause injury to the syndesmosis. Other injuries along the inside of the ankle must also be ruled out. For acute injuries, swelling and pinpoint tenderness along the syndesmosis is most often seen. Squeezing the lower leg muscles from side to side “squeeze test” may also cause pain in the ankle area. 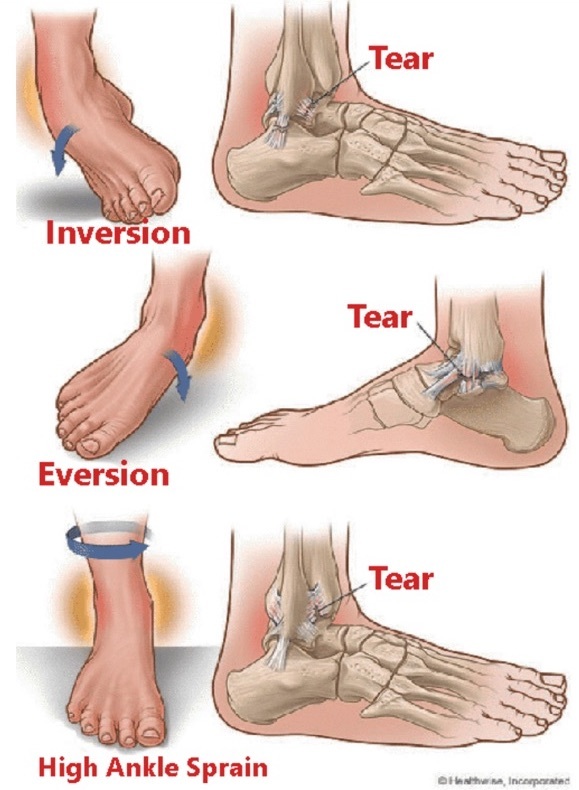 Moving the foot up and rotating it to the outside will also cause pain along the syndesmosis (low ankle sprains cause pain with the foot pointing down and in, which contrasts the difference). May be associated with swelling along the inside or outside of the ankle when other injuries are suspected. Difficulty weightbearing for moderate to severe injuries is extremely common. For mild injuries the patient may be able to weightbear. 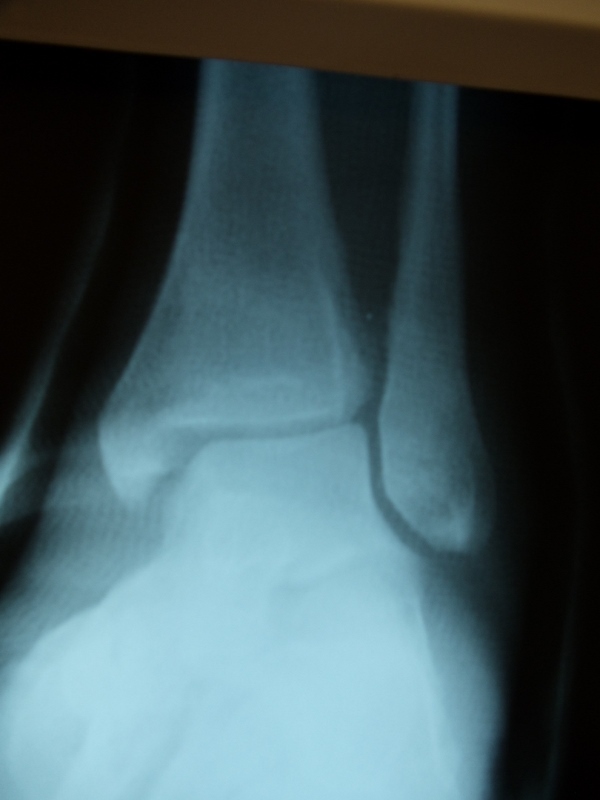 X-rays of the ankle are necessary to rule out a separation of the tibia and fibula, especially in injuries that cause disruption of all four ligaments. However, x-rays may not be able to completely evaluate an injury to the syndesmosis when some of the four ligaments are intact. 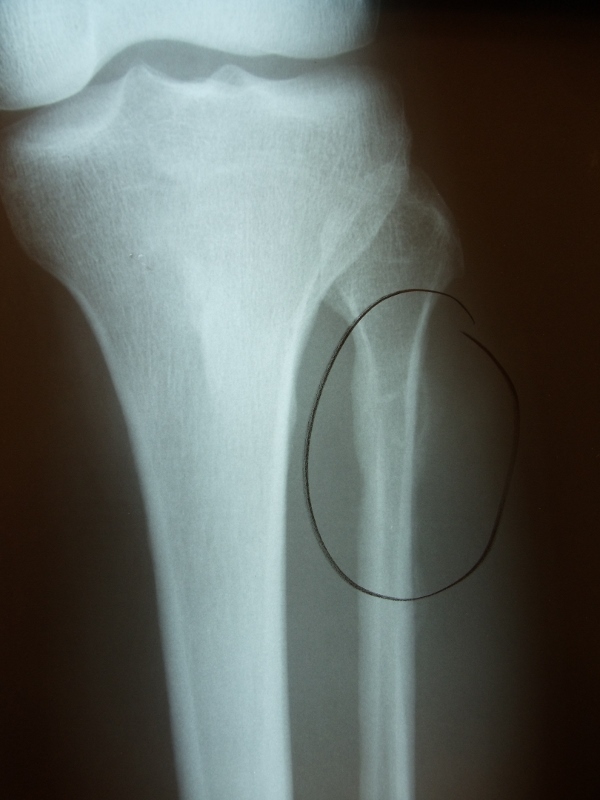 X-rays will also help to rule out any bony injury that may be associated with injuries to the syndesmosis. Stress testing may be performed under fluoroscopy, which allows us to move the foot in a certain position to try to produce a separation between the two ankle bones. MRIs are more definitive for syndesmotic injuries. Ruptures of one or more of the ligaments are easily seen on the axial images. MRIs are also able to evaluate any abnormal position of the syndesmosis, which could contribute to long-term problems. CT scans can be used to evaluate the position of the tibia relative to the fibula. They are most often used in this injury. Conservative care for isolated injuries without a separation of the bones is performed in almost all cases. This can include a short period of immobilization with or without weight-bearing. Physical therapy then follows for an encouraged range of motion, strength and stability and a return to sports and activities. These ligaments heal reliably without any long-term problems if the entire syndesmosis has not been torn. These ligament injuries take longer to heal than typical low ankle sprains. 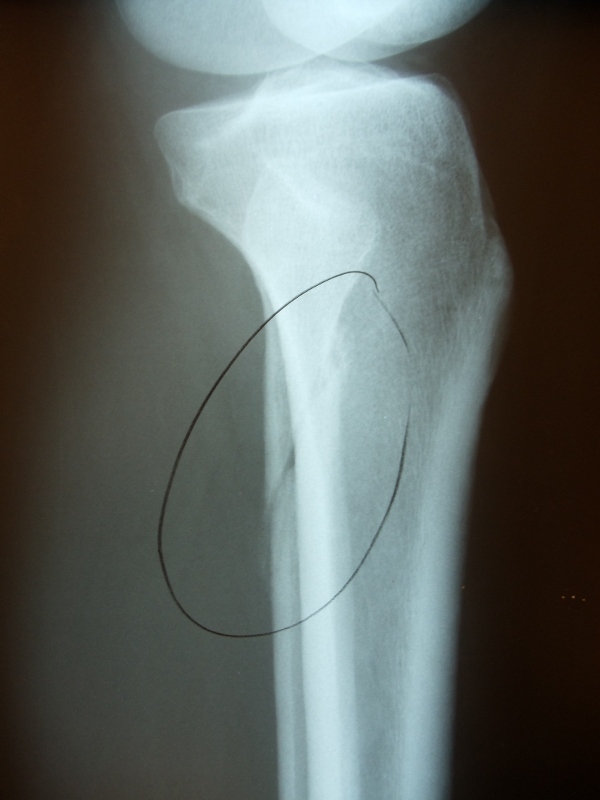 Complete ruptures of the syndesmosis, which show the tibia and fibula to be separated, need to be addressed surgically. Fractures to the ankle must always be ruled out. The procedure is performed on an outpatient basis under a twilight or general anesthetic. 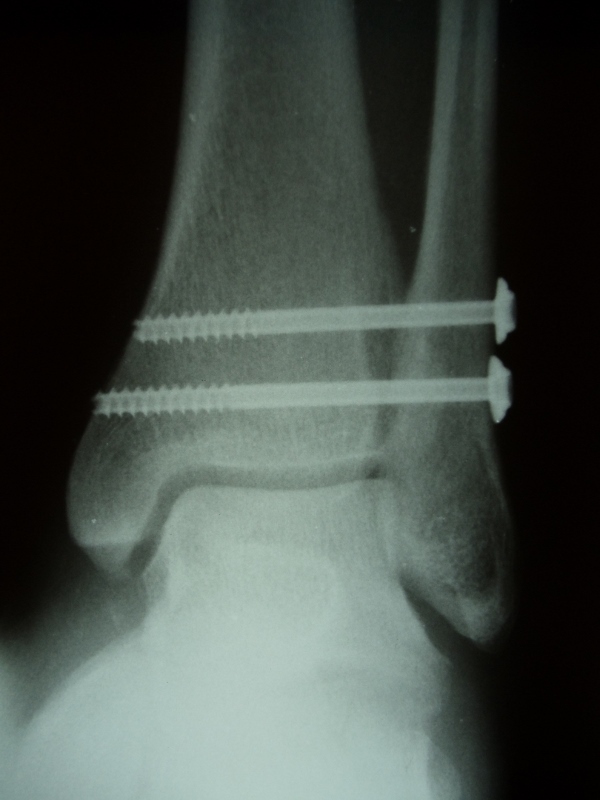 One or two screws are placed from the fibula into the tibia to reduce the bone separation and allow healing of the ligaments. Immobilization (boot or cast) may be for 4-6 weeks. However, nonweightbearing (using crutches) is necessary for up to 12 weeks. 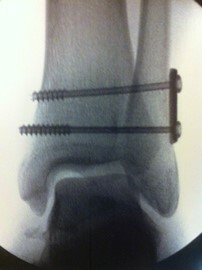 Screws may or may not be removed for three months. 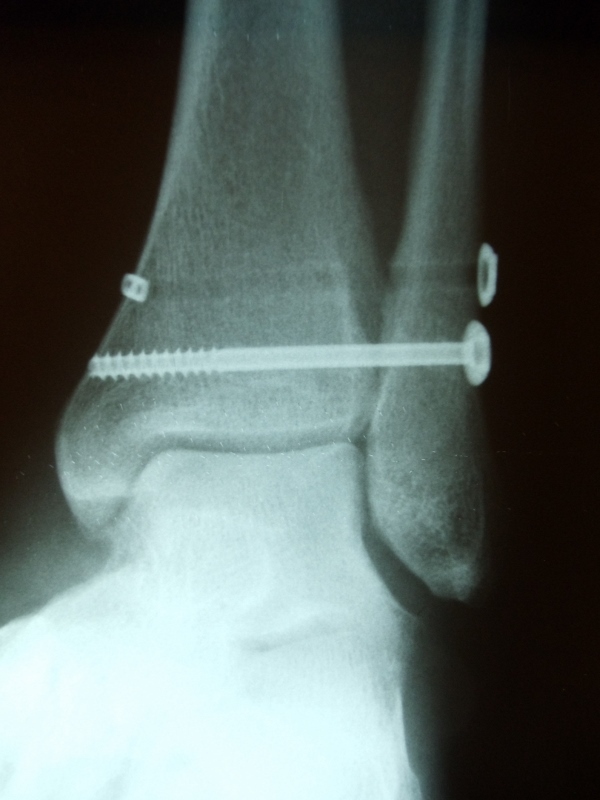 We often replace the screws with large caliber sutures that maintain the reduction of the syndesmosis and allow normal motion of the ankle joint. At times these large sutures (tightropes) may be used in lieu of screws to prevent us from doing secondary surgical procedures. The degree of injury often dictates whether we use screws or suture buttons to repair the syndesmosis. For mild injuries to the syndesmosis, conservative care produces an excellent long-term outcome. A return to sports within 6-8 weeks usually follows conservative care. Occasionally an impingement may develop in the ankle, necessitating a small cortisone shot to restore better motion to the ankle. A full recovery is expected in most cases. When surgery is performed for moderate to severe injuries, the prognosis is excellent following a screw or suture button reduction of the syndesmosis. Return to sports may take 4-6 months. It is expected that our patients will continue to improve for 12-18 months following the surgical procedure. It is imperative to reduce the syndesmosis accurately to prevent any malalignment. 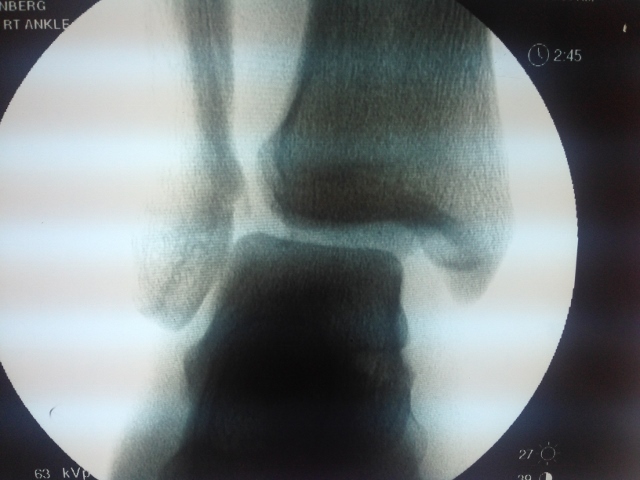 Preop and Postop Fibula Fracture ORIF with Syndesmotic and Deltoid Rupture. 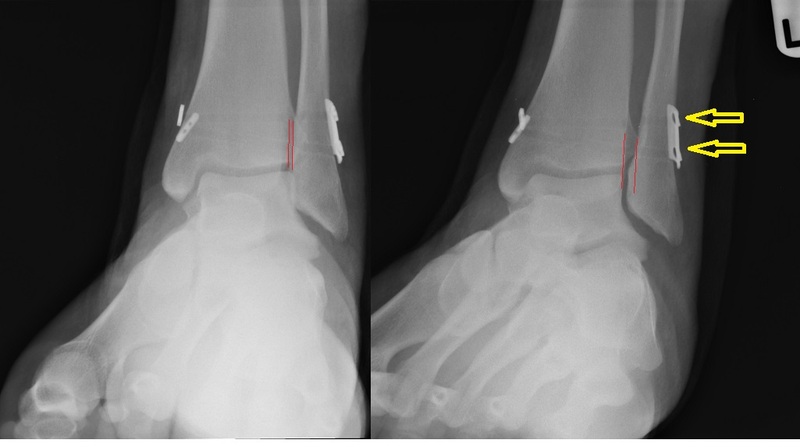 The patient has an ORIF Fibula fracture and a temporary screw placed across the syndesmosis for 12-16 weeks and then permanently implanted an Arthrex Tightrope to maintain stability but allow physiologic motion. Above is a teen male who had an ankle injury playing football, had ankle pain and was sent for MRI which verified a tear in the long ligament of the ankle called the syndesmosis. 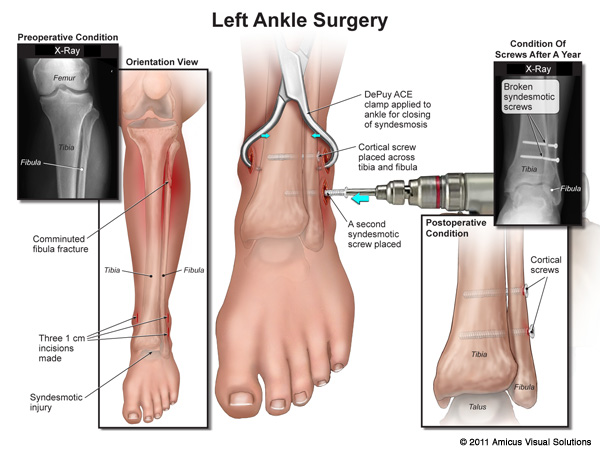 A procedure involving putting two sutures called tightropes with a surgical plate in order to secure the stability of the ankle relationship with the two long bones insuring appropriate healing the the ligament. Patient healed well and went on the participate in baseball. • For mild injuries to the syndesmosis, conservative care produces an excellent long-term outcome. A return to sports within 6-8 weeks usually follows conservative care. Occasionally an impingement may develop in the ankle, necessitating a small cortisone shot to restore better motion to the ankle. A full recovery is expected in most cases. • When surgery is performed for moderate to severe injuries, the prognosis is excellent following a screw or suture button reduction of the syndesmosis. Return to sports may take 4-6 months. It is expected that our patients will continue to improve for 12-18 months following the surgical procedure. It is imperative to reduce the syndesmosis accurately to prevent any malalignment. 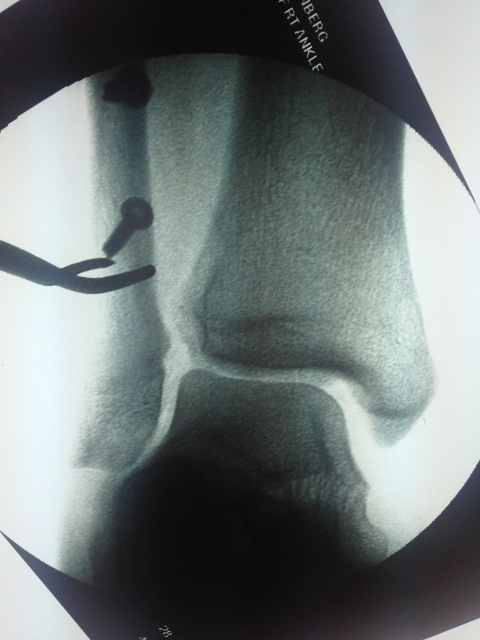 Post surgical reduction by our doctors, we were able to reduced the syndesmosis successfully with fixation by the TightRope System (Arthrex, Inc) using the original plate put into the ankle at the fibula and adding as smaller plate at the tibia to act as a pressure distribution buttress. The level of the tight rope is indicated bu the yellow arrows. Below is and intra-operative flouriscopic view of a severe syndesmotic rupture and there are two examples of repair using screws (top right) or Tight Rope suture( bottom ). 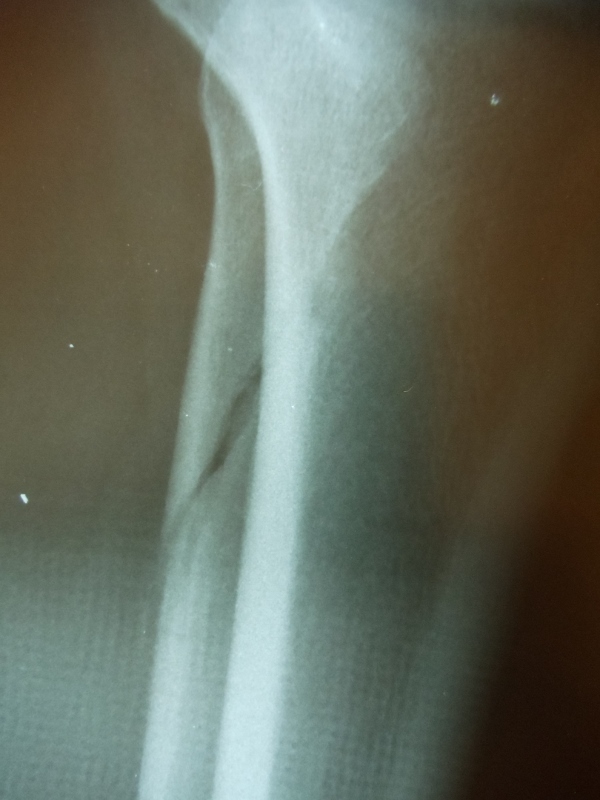 Another example of a syndesmotic rupture (left), with seperation seen especially at the medial clear space. One could also use a combination of a two hole plate and screws to reduce the syndesmosis(right). 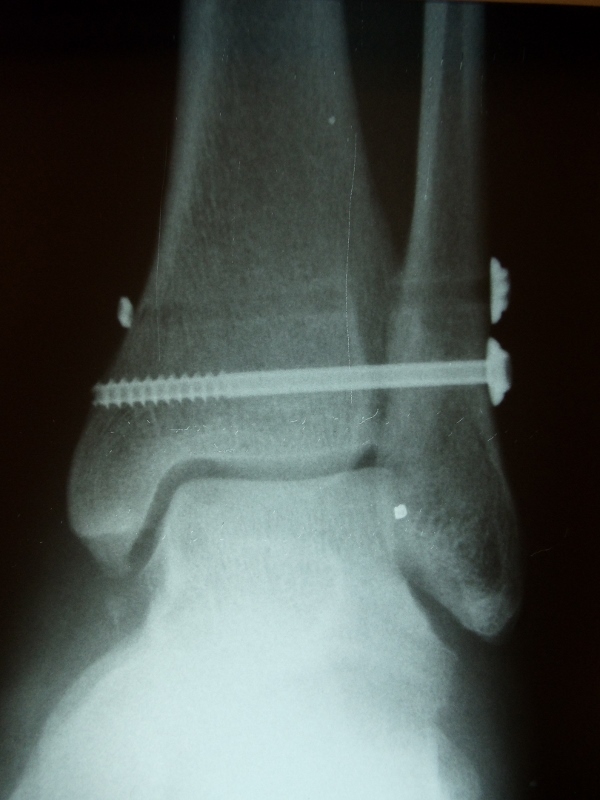 If there is also fracture of the fibula, then that fracture is typically repaired with screws and a plate as seen in the image below, but the syndemosis is also repaired using a Tight Rope suture incorporating the fracture plate. This is failed syndesmotic repair due to early weightbearing and screw breakage. Widening can be seen between the medial malleolus and talus. 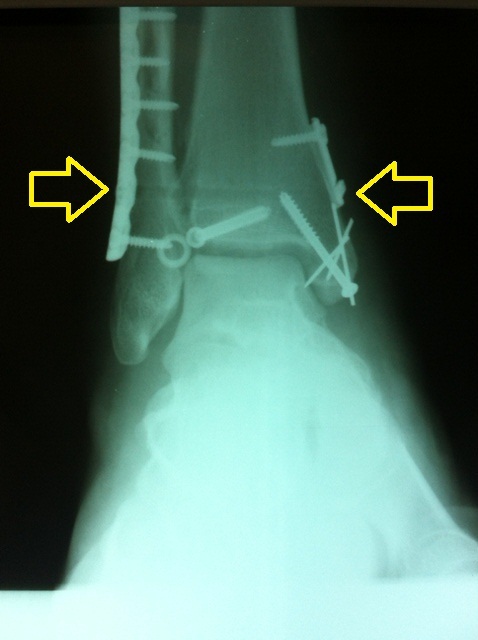 The picture below is after the screws were removed from the fibula and the holes were burred larger so the old screws would not cause any loss of reduction. 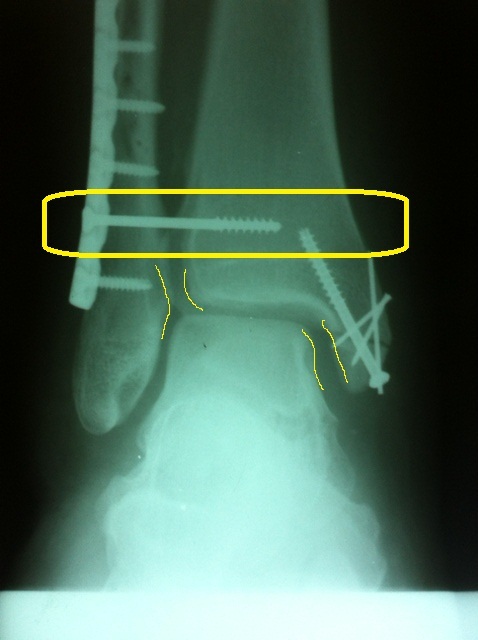 After reduction, 2 screws were placed across both bones completely and two Arthrex Tightropes were placed to add stability. Before and After X-rays of syndesmotic rupture with proximal fibular fracture. The first surgery is 2 syndesmotic screws. After 12 weeks, the proximal screw was removed and a tight rope was applied. The second screw was left in for increased stability. 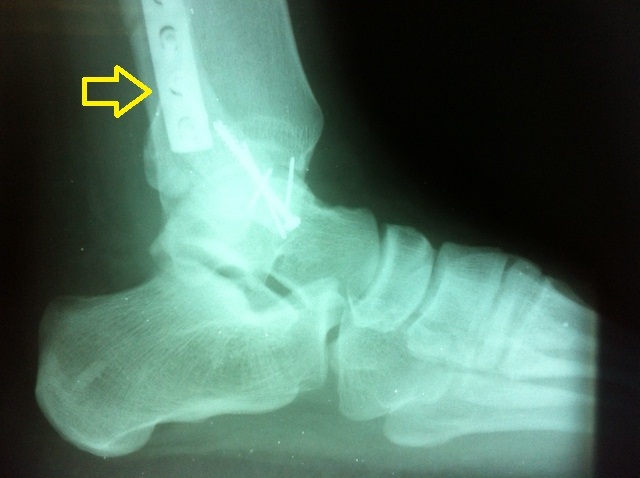 After 12 weeks, the proximal screw was removed and an Arthrex tightrope was applied. The distal screw was left in place to add in stability. (Now, the ankle joint is anatomic and symmetrical. 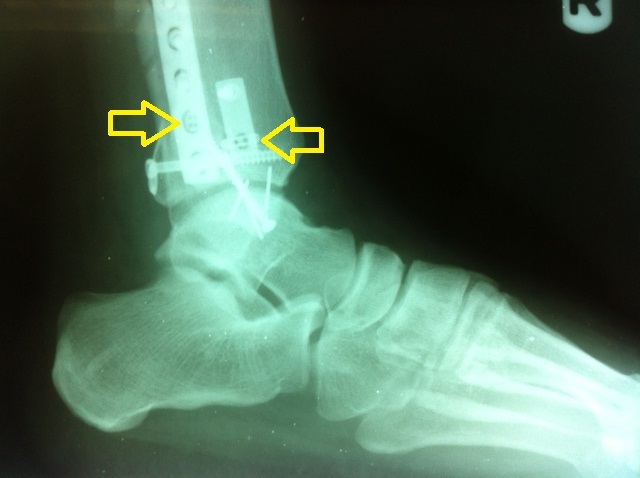 A plate and screws is placed on the fibula after reduction and 2 Arthrex Tightrope is placed across the syndesmosis to maintain reduction. This can be seen as the two "buttons" on the right side of the xrays on the tibia.